Eddie Lewis has been giving trumpet and jazz clinics since the mid 1980’s. The perspective he shares with the students challenges them to strive for excellence while at the same time assuring them that they really can do it. 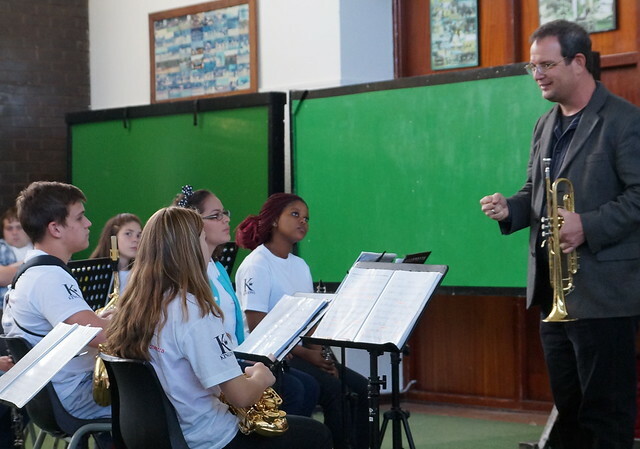 Eddie Lewis working with students from the East London Wind Symphony, in East London, South Africa. Eddie can present clinics on a variety of topics, but the following is a list of topics he has already taught or for which he already has materials prepared. Usually, when someone hires Eddie to do a clinic, they already know what they want him to teach. Maybe the students are having trouble with range, so they hire Mr. Lewis to work with the students in that capacity. So we offer the following list only as possible suggestions. Feel free to request any topic you think he is qualified to teach. If you are unfamiliar with Mr. Lewis’ qualifications, we invite you to explore this website. You can listen to his recordings, watch his videos, read about the books he has authored and about his experience as a performer and as an educator. And as always, if you have any questions at all, please feel free to ask by clicking HERE and using our contact form. Eddie Lewis will work with your jazz trumpet students to help them prepare for the All-Region or All-State jazz auditions. This clinic is meant to be given in the first couple months after solo and ensemble contest is finished. It deals with the things that the students should be doing to prepare for the next year’s All-State auditions. Eddie shares with the students the concept behind his most popular books. The Physical Trumpet Pyramid deals with physical rudiments and the information helps the students to improve their daily warm-ups. The language of jazz is not scales and arpeggios. The music of jazz is rich in motivic vocabulary and Eddie Lewis helps your students learn how to get started speaking that language with hands-on activities. Eddie teaches a simple formula for gaining strength on the trumpet. Greater strength leads to better tone, range and endurance.